Dymo Compatible Large Address Labels are great for printing high quality labels for your home or business. These labels are virtually indistinguishable from the Dymo 99012 labels but are available for a fraction of the price. Each bright white, high quality, self-adhesive label is designed to work with any Dymo Labelwriter printer and will add a professional appearance to your mailings. 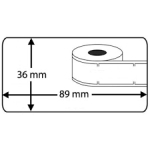 The 99012 labels measure 1-4/10” wide and 3-1/2” long and have a white background.